Legion and Exile forces are still recovering from a massive war within the Infernal Mines, but now a powerful force is making its way toward Delta V, ready to bring the Day of Reckoning to the planet and her people. This threat from another world will be unlike anything ever faced before, but there are ways to survive: attempt to appease the being or rally a shattered world to send the abomination reeling back to the darkest corner of the universe. I wonder which you will choose? 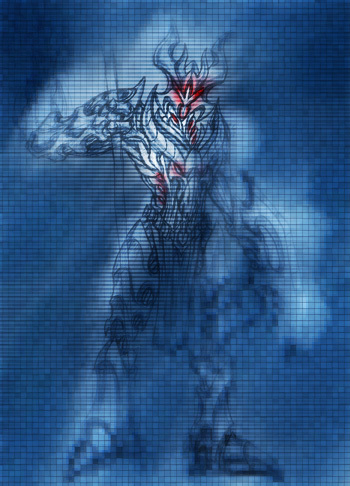 The Slayer does not take kindly to off-worlders intruding on his home turf so this Friday, he's prepared to finally release his personal stash of armor to help eager duelists to repel the alien threat. 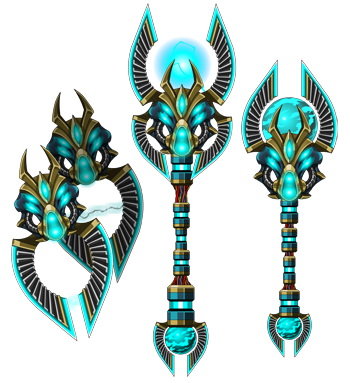 Additionally, he has crafted a brand new weapon, The Dragon Buster II broadsword* which will be included with the new 5 Key promotional package. 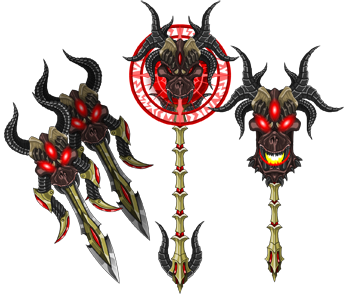 He will also be bringing back the legendary Dragon Weapons that return every year to commemorate Dragon*Con. Draconic Mutating weapons will leave as soon as Dragon*Con concludes. 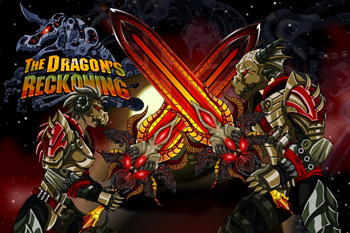 The Dragon Slayer Armor will be available for 5 keys, but as a special treat, players who see us and write down their EpicDuel character name at Dragon*Con will get the armor and sword for free! ** For more details, check out the Dragon*Con post below! 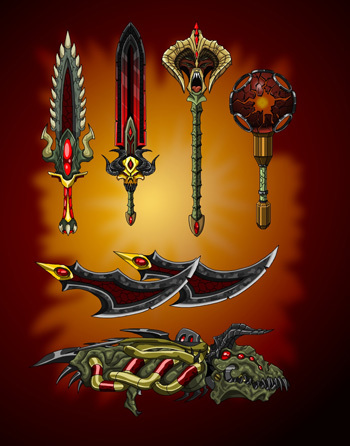 *We were previously going to buff the original Dragon Buster sword to offer in the promotional package, but our players made it clear that they wanted a brand new item and that it was not fair to buff the old item. 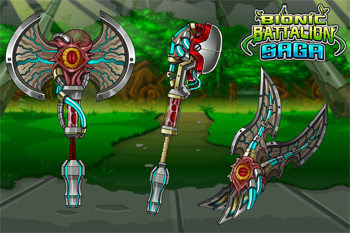 You reminded us of our old promise so we're honoring your request and introducing the Dragon Buster II broadsword. We will have images as soon as it's drawn! 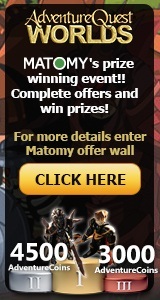 **To clarify, this offer is only valid for one EpicDuel character name per DragonCon attendee. 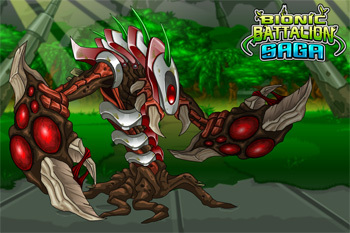 Once the new Dragon Slayer promotion goes live, we will be removing the Bionic Battlegear and the Bio Borg from the game forever! I know it's been around for awhile, but if you were procrastinating getting it for any reason, please do so before the release on Friday! The desolate wasteland known colloquially as the Barrens was not always so. At one point, it was a lush wilderness, but it had the misfortune of being mineral rich and tactically advantageous, two qualities that made it irresistible to Baelius and his corporation. After most of the easily accessible resources were tapped, a battery of turrets was installed as part of a massive planetary defense grid. Thousands of weapon batteries could adjust their trajectories to his targets on the other side of the planet and utterly annihilate targets in space. When war broke out, this battery was crucial in ending the insurrection and keeping any outside forces from entering Delta V's atmosphere. 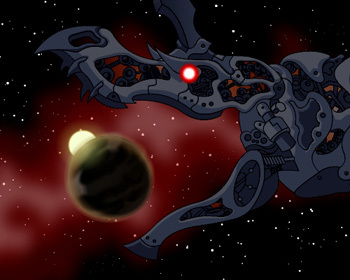 A suicide strike was ordered by resistance forces to break Baelius' chokehold over the region and divert the cannons away from the defense of Fortune City, and it partially succeeded. The makeshift fleet of freighters retrofitted with budget armaments and stolen military vessels rained from the skies over the Barrens until their secret payload could be delivered -- a massive EMP that disabled the turrets and remaining ships alike. But the General overseeing the Barrens was no fool, and turned the turrets on his own rebellious slaves to try and salvage the area. During the strike, the General was assassinated by his daughter’s personal bodyguard, but not before the turret gave its own killing blow- the blast from destroying the Uprising’s main weapon devastated the area, killing much of the area’s life, and corrupting the rest. I was browsing the grocery when my communicator rang. I thought it was Eldhi, asking for some spare parts or a tomato, but my heart sank when I saw the tag. Alaric was one of the few who would not assimilate into the Legion. Aegir said it was too foolish, too dangerous to live as Krampus anymore. I hated Aegir. The hand he extended was the hand of a conquerer, not a friend. But, his actions did keep the Administration from slaughtering us, but at the cost of our culture. Though, I had tried to convince Alaric that we should just sign the marriage papers in Fortune City instead of reassembling the council of elders. I thought about the card I carried, that gave a false name. My mother gave me the name Ylwa. My actions earned me the title Beast Rider. The card identifies me as Winter Page. Not the most common, not the most exotic. But it renders me invisible. The beeping brought me back to reality and I saw the message. “Ylwa and Aegir. Come immediately. The Shaken. Sorry, Shaman.” Oh Alaric. He never understood autocorrect. But his message, mangled as it was, was dangerous. There had to be a reason that he would take the risk of the Legion seeing he was still alive. I paid for my groceries and fled to the mountains. The abandoned strip mine was cold and dank, and the smell of mildew hit my nose as I entered the cavern. Aegir had beaten me to our hideout. Aegir had long ago abandoned his training as a Shaman to join the Shadow Guard, taking the name Edgar Boothe. But even so, he was seated across from his grandmother, staring into the fire. Both humming to the sound of the universe. I made my way around some of the other Krampus who had taken to living in the caves with us to find Alaric. He had long abandoned his royal finery, pawning the ceremonial armor to buy food for the Krampus orphans, and he was clad in rags. I embraced my betrothed and kissed him deeply. The concern was written plainly on his face. I held Alaric’s hand and we approached the mystics. They were chanting under their breath, but the chant increased in volume until they screamed the words so loudly that I prayed to the gods that my eardrums would break. I didn’t understand the language - it was an old tongue used only by Shamans. The color drained from Alaric’s face, and he ran out into the snow. I followed him. DragonCon takes place every year in Atlanta, Georgia. It is a weekend long convention (Recommended ages 15+) with 30,000+ attendees... most in amazing costumes. I guess it is really like a weekend long costume party with celebrity guests (walk of fame), panels featuring the casts of your favorite sci-fi/fantasy/etc TV shows, video games, art galleries, table top games, concerts, shopping and... well, check out the schedule on the DragonCon website. As usual, the Artix Entertainment team will be attending in force again this year, including Titan, Nightwraith, Charfade, and Rabblefroth! We will be running a panel and a fan table! Artix Entertainment ALL GAMES Panel: Saturday @ 5:30pm at the Hilton in Grand Salon E! Fan Table: We are taking turns running it all weekend. Located... um... wherever all the cool fan tables are. New Matomy Ad Offer on AExtras! From August 17th until September 2nd, Matomy is running a special AExtras offer! ONE lucky player who completes an offer will win the grand prize: a combo pack of the black Artix and Sepulchure action figures! You can also win either 3,000 or 4,500 ACs!